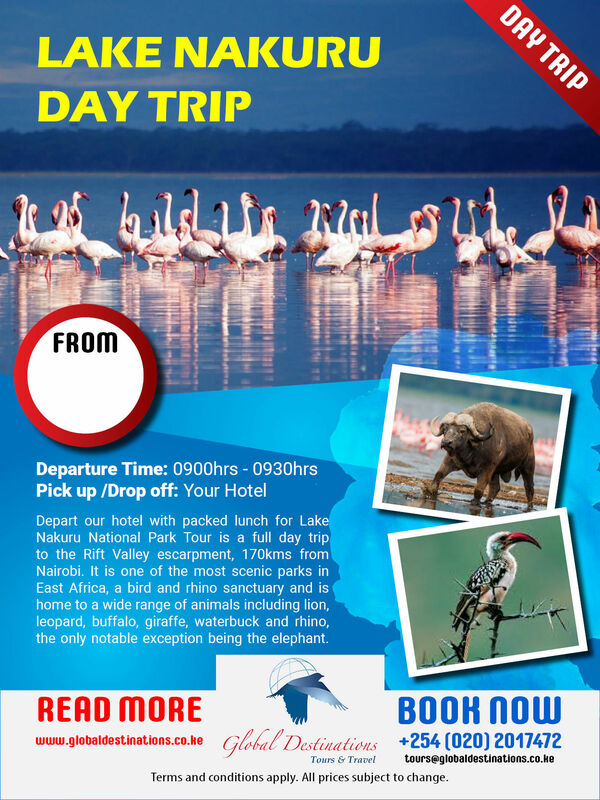 Depart our hotel with packed lunch for Lake Nakuru National Park Tour is a full day trip to the Rift Valley escarpment, 170kms from Nairobi. It is one of the most scenic parks in East Africa, a bird and rhino sanctuary and is home to a wide range of animals including lion, leopard, buffalo, giraffe, waterbuck and rhino, the only notable exception being the elephant. The park is also a bird watcher’s paradise, with 400 known species having been spotted here. Vegetation ranges from savannah to various indigenous forests. A world heritage site, Lake Nakuru is most famous for its million-plus grand pink flamingo population. House Number 13. Off Thika Highway, USIU Road. P O Box 67998 - 00200, Nairobi, Kenya.